Will this episode be in her new book? How about her racist graduate thesis at Princeton? Roanoke Times, 3-31-2019, Pg 1, 6: Despite problems, MVP work continues. The Anti-MVP entities, including their media bullhorn The Roanoke Times, have delayed this project on an ongoing basis. The delays extended the ‘open ditch’ portion of the pipeline work into a record breaking rainfall season that brought devastation throughout the area. As the kids would say: Nice move Ex-Lax! Damage included roads washed out, homes flooded, business and agriculture disrupted and even a significant Lynchburg dam was destroyed; all outside the scope and reach of the MVP. The wrath of Mother Nature can be devastating. All this Anti-MVP delay somewhat like cutting off one’s nose to spite one’s face! It’s clear that behind much of the Anti-MVP hostility are the Anti-Fossil-Fuel folks currently highlighted by the AOC-Green Deal (the new Marx Manifesto. RT, 3-31-2019, Pg 1, 8: Coal-fired power plants can’t compete as market shifts. A disturbing article gloating over the pain, to families and communities, of coal based entities shutting down despite Trump’s efforts to slow-down that sad process. The major coal alternative go-to is Fracking Natural Fossil Gas that is totally dependent on Gas Pipelines Not the existing Coal Rail Lines. Not highlighted is the nasty and deceitful war Obama and his minions waged upon Private Industry Fracking, including the ‘burning water faucets”! The AGW Goreites proclaim Armageddon is neigh if we don’t enact their Draconian changes to our energy systems ‘now’. AOC claims we only have 12-years left and we all know her scientific credentials are equivalent to Gore’s. Dec 2018: Greenland Ice MELTING FAST. Mar 2019: Greenland critical glacier GROWING! Do these Goreite Wizzards Not Know that Greenland sits on massive volcanoes and hotspots? Drawing conclusions about man-made CO2s effects on Greenland Ice that sits on a volcano is a level of dullness not normally found among ‘real’ scientists. Some time ago there was a Mile High glacier sitting on Old Faithful. News Flash: it wasn’t man-made global warming that melted that glacier either. Why Do AGW Alarmists Find it Necessary to Lie and SuperSize Their Draconian Claims of Doom? Moronic – Really? Trump was simply pointing out the Facts that wind and solar are intermittent and unreliable sources of energy that require 100% backup systems for 24-7-365 serviceability! Today that service is primarily fossil fuels, nuclear and hydro. Eliminating all fossil fuels by 2030 is what's moronic and was rejected by All Senate Democrats in recent vote. There are locations where there are significant amounts of wind in the range between 10 MPH start-up and 30+ MPH shut-down. The problem is the variability over both short and long time-frames. The renewable folks only talk about long term averages, like a turbine farm can satisfy 1500 homes. Somewhat like a statistician standing with one foot in freezing water and one foot in boiling water; on the average he feels great. The Virginia wind map indicates the Appalachian ridge and the off-shore continental shelf as potential turbine sites, each with significant environmental, practical and cost issues. (A) characteristic Wind-Turbine performance graph shows the relationship between wind speed and turbine output demonstrating the Reality that typical turbines run at major reductions below 20 MPH and Zero above 30+ MPH shut-down. The proponents of renewable energy will have to address the variability and intermittent nature of their supplies, their plan for 100% backup serviceability and their total system costs. In the mean time they are selling what sounds good over what works! 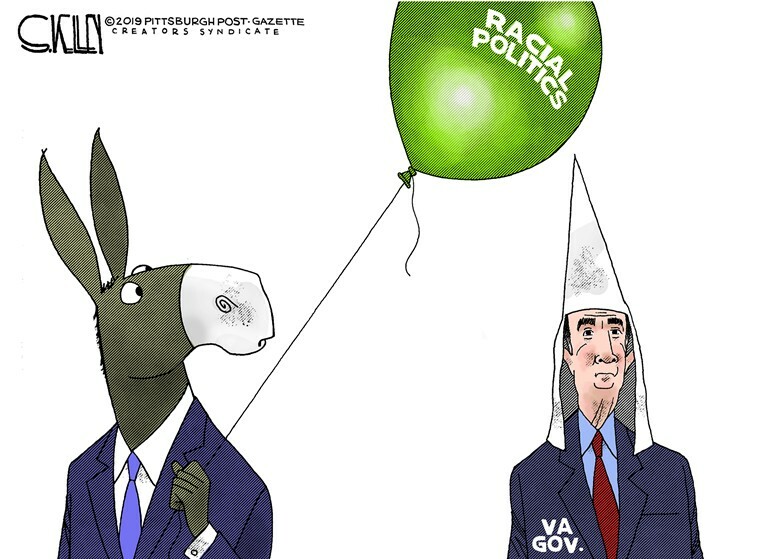 Only a Virginia Democrat governor disgraced by racist content in his graduate yearbook would come up with an atonement offering like this one. Northam giving One-Million Dollars of "TaxPayer Money" to minority special interests to atone for HIS transgressions! Certainly doesn’t hold a candle to Martin Luther at Cayonis! Love the Va Black Caucus accepting his tribute --- wonder what they’re thinking? Something about a cracker – you think? 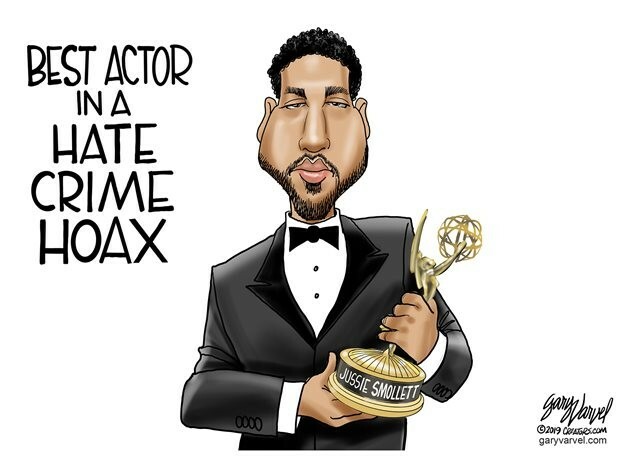 This is RealNews – you can’t make this ‘stuff’ up! “RICHMOND — D. Gov. Ralph Northam has found a new budget tool for regaining some favor with African-American legislators: money to help minority- and woman-owned businesses compete for government procurement contracts. Youth’s brains are not adequately developed until 23 to know and accept the consequences of their actions! These same people are using that premise to essentially pardon youth’s for crimes they commit – community service and no record of arrest or conviction! Oh wait -- have to be 21 to have a drink! Oh wait -- have to be 21 to smoke! Go to Jail -- she's too young to give her consent! Just Build The Wall Already! Obama Hillary and Schumer all VOTED FOR THE FENCE-WALL LAW! “HARRISONBURG, Va. - A dozen members of what the Department of Justice considers one of the most dangerous international crime organizations were indicted in Virginia. Twelve members of Jalisco New Generation Cartel (CJNG), a Mexican-based criminal organization, were indicted on federal drug conspiracy charges on March 5 by a grand jury in Harrisonburg's U.S. District Court. The indictment alleges that CJNG members recruited people from Mexico to live in Axton and Winchester to help with the distribution of the drugs. The homes these people lived in were allegedly used for receiving, storing packaging and distributing drugs received directly from CJNG. How did all these animalistic murderers get into the US? Apparently they just walked in and many just hanging-out in our Sanctuary states and cities! Isn’t it comforting to know that Dem. Gov Northam supports Sanctuary Communities in Virginia! Schultz sounds like Trump without a Tweet-Machine and the Macho Talk. Let’s all focus on what Trump Does – Not on what he says and Tweets! All the Democrats voted 'Present' -- talk about leadership and commitment. 'Enemy of the American People' based on their contribution to and leadership in the failed Coup of the duly elected POTUS. Sedition is a Crime! A Pox be on their houses! Shining a light on some of the Real Costs and Impacts to the people and businesses of Roanoke caused by the misguided Endangered Species Act and those who have weaponized it! OUR Government spent $72-Million Dollars of TaxPayer money to do Roanoke River Flood Control. Because of the Snail Darters and Log Perch, the river bottom could Not be Dredged and therefore the project became ‘River Bank Beautification” with minimal flood remediation. The Roanoke Times, apoplectic that the public would become aware of this gross malfeasance on behalf of these elusive so called ‘endangered fish’ that no one ever sees, refuses to acknowledge this pathetic and painful causal situation for the people and businesses of Roanoke. This from a ‘news’ paper that purports to tell the public the ‘real’ news however negative to their ‘pet rocks’. The latest adverse consequences of this so called ‘flood control’ boondoggle are the costs and pain of removing homeowners from their homes and demolishing their dwellings. 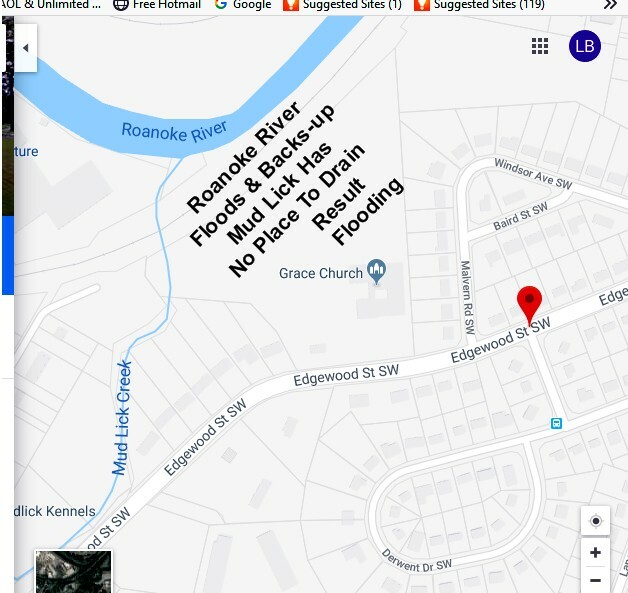 Since the deadly flood of 1985, Roanoke has bought and demolished 118 flood-prone properties through the FEMA program, at a total cost of $6.3 million. The Same Fraudulent’s That Gave Us The Trump Collusion Heifer-Dust and the Goreite Man-made Global Warming Alarmism have now morphed into the ‘New Green Deal’ cooked-up in the same witch’s cauldron! Yet another Karl Marx Manifesto! Where are the AGW core scientific data, computations and algorithms for real peer review? Where are the correlations to actual Real data and history? Why don’t the 102-models represent Real Data and history? Where are the open public debates? Why are the AGW-Alarmists fighting FOIA requests for public view of the data? 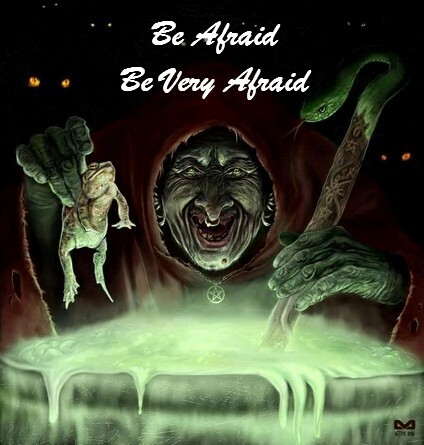 Why are the Goreites denigrating, threatening and maligning the Skeptics? 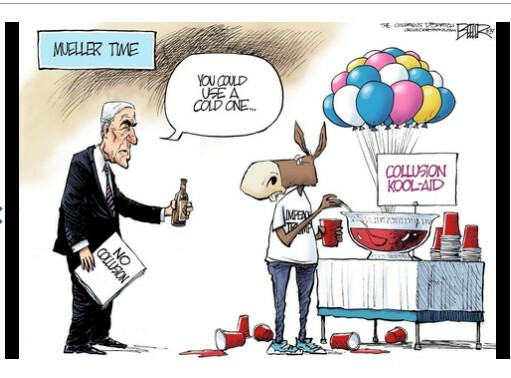 No Collusion - No Obstruction - No Regime Change - It Was An Enemies Witch-Hunt! 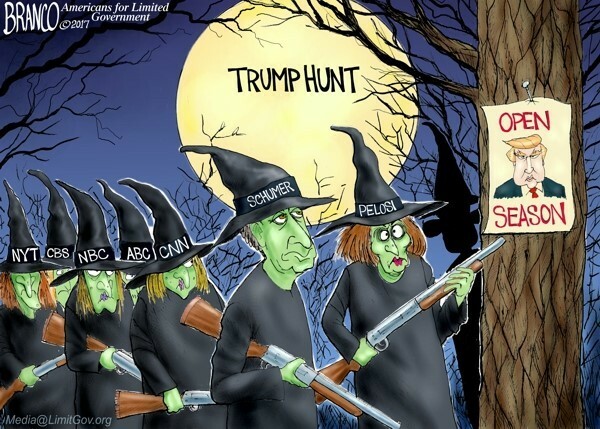 “The mainstream media suffered a collective stroke Friday evening after the office of Special Counsel Robert Mueller handed its final report of its Russia investigation to the Department of Justice. All at the direction of Obama and his subversive Resist Movement! At what point does subversion become sedition? 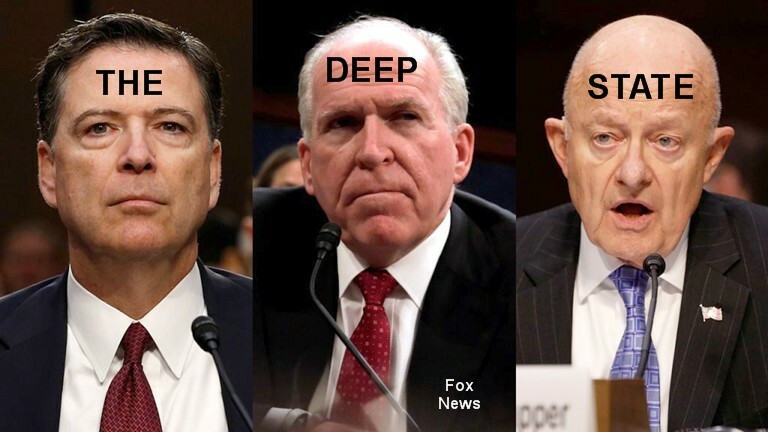 A criminal investigation of those who conspired and acted upon a political Coup d’etat’ of the duly elected POTUS!